In the retrospective study, led by Dr. Edith Groenendijk (left) of Dental Implant Clinic “Implantologie Den Haag” in The Hague, The Netherlands, one surgeon treated 16 consecutive patients with one failing maxillary incisor between natural neighboring teeth. Seven implants were placed at position 11, five at position 21, two at position 12, and two at position 22. Fig. 1 Tooth 21 is considered lost due to trauma. Fig. 2 A small FOV (6×6 cm) standard resolution (85 kV, 15 mA) CBCT scan is made for diagnosis (Fig. 2A) and planning (Fig. 2B). A minimum of 4 mm vertical bone dimension at the palato-apical part has to be present to reach primary stability, and a minimum of 2 mm space in between the implant and buccal crest in order to create stable hard tissue in front of the implant. Fig. 3 After performing the drill protocol, and before implant installation, the socket is filled with bone substitute. To prevent obstruction with bone substitute particles, the last used drill is placed into the implant bed (Fig. 3A). After removal of the last used drill, a tunnel is present through which the NobelActive implant is placed. Fig.4A & B A temporary abutment is placed onto the NobelActive implant and will not be removed until the impression taking of the final crown. the screw access channel to prevent composite material flowing into it. Fig. 6A. Direct post-operative image of the temporary crown: the interdental spaces are held open to stimulate soft tissue ingrowth. Fig. 6 B. Intra-oral image of the wound healing 2 weeks post-operative: nice and optimal soft-tissue ingrowth with mid-buccal soft-tissue level gain. Fig. 7 Permanent crown directly after placement. No pressure on the soft tissue is allowed. The patients who were treated with immediate implant placement were required to have an intact extraction socket present, sufficient occlusal support, an absence of periodontal disease and bruxism. In addition, bone height apical from the failing tooth’s socket had to be at least 4 mm to ensure primary stability. Immediate implant placement was contraindicated by drug or alcohol abuse, daily smoking habits of more than 10 units, and when negative bone reactions caused by severe osteoporosis or other conditions could be inspected. Another necessity for immediate implant placement to take place was the presence of sufficient palatal bone volume. This would not only ensure sufficient primary stability for the implant to permit immediate restoration, but also allowed for the creation of a distance of at least 2mm between the buccal implant contour and the inner buccal crest. Once atraumatic extraction had taken place, periodontal ligament and inflamed tissue residues were removed with a bone excavator and the socket was cleaned extensively. 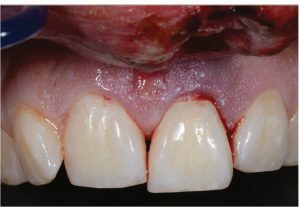 The keratinized gingiva remained intact since no flaps were raised. 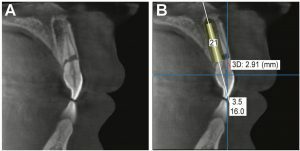 For the subsequent osteotomy, a drill protocol in line with the manufacturer’s guidelines for NobelActive implants was used given that this was the implant material employed. After application of a bone substitute the implant was inserted, with the implant seat set 3mm deeper than the buccal gingival margin, at which point a low- dose CBCT scan was conducted to evaluate the implant’s position. A temporary titanium NobelProcera abutment was then positioned onto the implant. Six months later, either an individualized, screw-retained, zirconia-porcelain crown or an individualized NobelProcera zirconia abutment with a cemented porcelain facing was placed, with another CBCT scan taking place. 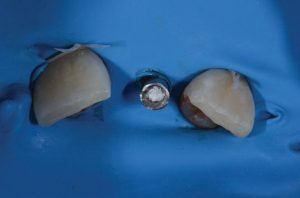 In terms of both function and esthetics, the results of the 16 patients treated with this immediate implant placement protocol were of a positive nature. Immediate post-operative buccal crest thickness was shown by CBCT scans to increase by 1.5 mm (mean), from 0.9 mm (mean) to 2.4 mm (mean). At a mean of 103 weeks after immediate implant placement, the final thickness of the buccal crest was compacted to 1.8 mm (mean), a result of the settling of the bone substitute or resorption of the buccal cortical crest. In addition, the buccal crest height increased by 1.6 mm (mean) to an average of 1.2 mm coronal on the implant shoulder. These observed changes were both statistically significant. Esthetically speaking, the WES scores demonstrated a total score of 8.4 out of 10, with the PES scores revealing a total of 11.8 out of 14. Both of these scores were higher than those in other studies4-41 regarding immediate implant placement. An increase in the mid-facial soft tissue level was noticed, and the employed immediate implant placement protocol resulted in a higher PES score than reported for either conventional – or early implant installation. Within the limitations of this study, the results of this specific immediate implant placement protocol that creates a buccal hard tissue dimension in front of an implant by use of a bone substitute were shown to be promising. The study’s authors recognized long-term, prospective research on this topic with a large number of patients, as a necessary next step. 1. Groenendijk E, Staas T, Graauwmans F, Bronkhorst E, Maal T, Meijer GJ. Immediate implant placement: the fate of the buccal crest. A retrospective cone beam computed tomography study. Int J Oral Maxillofac Surg. 2017;46(12):1600-1606. 2. Belser UC, Grutter L, Vailati F et al. Outcome evaluation of early placed maxillary anterior single-tooth implants using objective esthetic criteria: a cross-sectional, retrospective study in 45 patients with a 2- to 4-year follow-up using pink and white esthetic scores. J Periodontol. 2009;80:140–151. 3. Fürhauser R, Florescu D, Benesch T et al. Evaluation of soft tissue around single-tooth implant crowns: the pink esthetic score. Clin Oral Impl Res. 2005;16:639–644. 4. Spin-Neto R, Stravropoulos A, Dias Pereira LA et al. Fate of autologous and fresh-frozen allogenic block bone grafts used for ridge augmentation. A CBCT-based analysis. Clin Oral Implants Res. 2013;24:167–173. 5. Grunder U, Gracis S, Capelli M. Influence of the 3-D bone-to-implant relationship on esthetics. Int J Periodontics Restorative Dent 2005;25:113–9. 6. Ferrus J, Cecchinato D, Pjetursson EB, Lang NP, Sanz M, Lindhe J. Factors Influencing ridge alterations following immediate implant placement into extraction sockets. Clin Oral Impl Res 2010;21:22–9. 7. Chen ST & Buser D. Esthetic outcomes following immediate and early implant placement in the anterior maxilla – a systematic review. Int J Oral Maxillofac Implants 2014;29(Suppl):186–215. 8. Tan WL, Wong TL, Wong MC, Lang NP. A systematic review of post-extractional alveolar hard and soft tissue dimensional changes in humans. Clin Oral Implants Res 2012;23(Suppl 5):1–21. 9. Wang RE, Lang NP. New insights into ridge preservation after tooth extraction. Clin Oral Implants Res 2012;23(Suppl. 6):147–56. 10. Darby I, Chen ST, Buser D. Ridge preservation techniques for implant therapy. J Oral Maxillofac Impl 2009;24(Suppl):260–71. 11. Chen ST, Beagle J, Jensen SS, Chiapasco M, Darby I. Consensus statements and recommended clinical procedures regarding surgical techniques. Int J Oral Maxillofac Impl 2009;24(Suppl):272–8. 12. Ten Heggeler JM, Slot DE, Van Der Weijden GA. Effect of socket preservation therapies following tooth extraction in non-molar regions in humans: a systematic review. Clin Oral Implants Res 2011;22:779–88. 13. Vignoletti F, Matesanz P, Rodrigo D, Figuero E, Martin C, Sanz M. Surgical protocols for ridge preservation after tooth extraction: A systematic review. Clin Oral Implants Res 2012;23(Suppl. 5):22–38. 14. Hämmerle ChHF, Arau´jo MG, Simion M. Evidence-based knowledge on the biology and treatment of extraction sockets. Clin Oral Implants Res 2012;23(Suppl. 5):80–2. 15. Silicia A, Botticelli D. Computer-guided implant therapy and soft- and hard- tissue aspects. Clin Oral Implants Res 2012;23 (Suppl. 6):157–61. 16. Sanz M, Lindhe J, Alcaraz J, Sanz-Sanchez I, Cecchinato S. The effect of placing a bone graft in the gap at immediately placed implants: a randomized clinical trial. Clin Oral Implants Res 2016. [in press]. 17. Von Arx T, Buser D. Horizontal ridge augmentation using autogenous block grafts and the guided bone regeneration technique with collagen membranes: a clinical study with 42 patients. Clin Oral Implants Res 2006;17:359–66. 18. Pagni G, Pellegrini G, Giannobile WV, Rasperini G. Review Article – Post extraction alveolar ridge preservation: biological basis and treatments. Int J Dent 2012;6:1–13. 19. Weijs WL, Siebers TJ, Kuijpers-Jagtman AM, Berge´ SJ, Meijer GJ, Borstlap WA. Early secondary closure of alveolar clefts with mandibular symphyseal bone grafts and beta-tri calcium phosphate (beta-TCP). Int J Oral Maxillofac Surg 2010;39:424–9. 20. 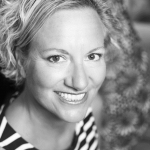 Evans CD & Chen S. Esthetic outcomes of immediate implant placements. Clin Oral Impl Res 2008;19:73–80. 21. Sanz M, Cecchinato D, Ferrus J, Pjetursson EB, Lang NP, Lindhe J. A prospective, randomized-controlled clinical trial to evaluate bone preservation using implants with different geometry placed into extraction sockets in the maxilla. Clin Oral Impl Res 2010;21:13–21. 22. Chen ST, Darby IB, Reynolds EC. A prospective clinical study of non-submerged immediate implants: clinical outcomes and esthetic results. Clin Oral Implants Res 2007;18:552–62. 23. Den Hartog L, Huddleston Slater JJR, Vissink A, Meijer HJA, Raghoebar GM. Treatment outcome of immediate, early and conventional single-tooth implants in the aesthetic zone: a systematic review to survival, bone level, soft-tissue, aesthetics and patient satisfaction. J Clin Periodontol 2008;35:1073–86. 24. Quahash M, Susin C, Polimeni G, Hall J, Wikesjo¨ UME. Bone healing dynamics at buccal peri-implant sites. Clin Oral Implants Res 2008;19–2:166–72. 25. Cho Y-B, Moon S-J, Chung ChH, Kim H-J. Resorption of labial bone in maxillary anterior implant. J Advanced Prosthodont 2011;3:85–9. 26. Arau´jo MG, Wennstrom JL, Lindhe J. Modeling of the buccal and lingual bone walls of fresh extraction sites following implant installation. Clin Oral Implants Res 2006;17:606–14. 27. Arau´jo MG, Linder E, Lindhe J. Bio-Oss Collagen in the buccal gap at immediate implants: a 6-month study in the dog. Clin Oral Implants Res 2011;22:1–8. 28. Esposito M, Grusovin MG, Polyzos IP, Felice P, Worthington HV. Timing of implant placement after tooth extraction: immediate, immediate-delayed or delayed implants? A Cochrane systematic review. Eur J Oral Implantol 2010;3:189–205. 29. Miyamoto Y, Obama T. Dental cone beam computed tomography analyses of post- operative labial bone thickness in maxillary anterior implants: comparing immediate and delayed implant placement. Int J Periodontics Restorative Dent 2011;31:215–25. 30. Belser UC, Grutter L, Vailati F, Bornstein MM, Weber HP, Buser D. Outcome evaluation of early placed maxillary anterior single-tooth implants using objective esthetic criteria: a cross- sectional, retrospective study in 45 patients with a 2- to 4-year follow-up using pink and white esthetic scores. J Periodontol 2009;80:140–51. 31. Furhauser R, Florescu D, Benesch T, Haas R, Mailath G, Watzek G. Evaluation of soft tissue around single-tooth implant crowns: the pink esthetic score. Clin Oral Impl Res 2005;16:639–44. 32. Arau´jo M, Linder E, Wennstro¨m J, Lindhe J. The influence of Bio-Oss Collagen on healing of an extraction socket: an experimental study in the dog. Int J Periodontics and Restorative Dent 2008;28:123–35. 33. Spin-Neto R, Stravropoulos A, Dias Pereira LA, Marcantonio Jr E, Wenzel A. Fate of autologous and fresh-frozen allogenic block bone grafts used for ridge augmentation. A CBCT-based analysis. Clin Oral Implants Res 2013;24:167–73. 34. Iasella JM, Greenwell H, Miller RL, Hill M, Drisko C, Bohra AA, Scheetz JP. Ridge preservation with freeze-dried bone allograft and a collagen membrane compared to extraction alone for implant site development: a clinical and histologic study in humans. J Periodontol 2003;74:990–9. 35. Vance GS, Greenwell H, Miller RL, Hill M, Johnston H, Scheetz JP. Comparison of an allograft in an experimental putty carrier and bovine-derived xenograft used in ridge preservation: a clinical and histologic study in humans. Intl J Oral Maxillofac Impl 2004;19:491–7. 38. Pieri F, Aldini NN, Manchetti C, Corinaldesi G. Esthetic outcome and tissue stability of maxillary anterior single-tooth implantsfollowing reconstruction with mandibular block grafts: a 5-year prospective study. Int J Oral Maxillofac Implants 2013;28:270–80. 39. Cosyn J, Eghbali A, De Bruyn H, Collys K, Cleymaet R, De Rouck T. Immediate singletooth implants in the anterior maxilla: 3-year results of a case series on hard and soft tissue response and aesthetics. J Clin Periodontol 2011;38:746–53. 40. Raes F, Cosyn J, Crommelinck E, Coessens P, De Bruyn H. Immediate and conventional single implant treatment in the anterior maxilla: 1-year results of a case series on hard and soft tissue response and aesthetics. J Clin Periodontol 2011;38:385–94. 41. Noelken R, Neffe BA, Kunkel M, Wagner W. Maintenance of marginal bone support and soft tissue esthetics at immediately provisionalized OsseoSpeed implants placed into extraction sites: 2-year results. Clin Oral Impl Res 2013;25:214–20.